In a perfect world, beekeepers would never need to be concerned about feeding bees for winter. Every season would provide abundance nectar for all colonies. And some beekeepers feel strongly about the issue of feeding bees …..or not feeding. However, nature has many uncontrollable factors. The honey bee colony is subject to the same environmental stress facing other life forms. In our area, long hot summers with little rain can lead to a reduced amount of nectar. We call this a dearth. Weather pattern changes also bring drought or flooding rain. All weather issues affect the foraging of our honey bee colonies. Most beekeepers who manage several colonies in one location will need to feed their honey bees at some point. Because we live in a temperate climate (with a cold winter for most), feeding bees for winter storage may be critical to colony survival. Those beekeepers who experience abundant honey production in Fall must guard against harvesting too much honey. Honey bees are livestock and require proper management just as you would do with cattle, horses, etc. Do You Need to Feed Every Colony Before Winter? No, not every colony will need to be fed. If your honey bee hives are heavy with stored honey, great ! That is the condition that we beekeepers strive to achieve. Bee hives full of plenty of honey for the Winter months. How much honey do your bees need? That is dependent on your location and the duration of Winter weather. Most any colony that lives in a region with Winter cold will need a minimum of 60#. Some colonies need much more. Connect with local beekeepers through your state agricultural departments. Or find beekeepers online who live in a similar climate. These people will be your very best sources for this type of information. Perhaps you are against feeding bees at any time. If the bees are doing well on their own, that’s okay. But if they starve, that one is on you as well. Placing numerous colonies together for management purposes creates competition for food. We must remember that even though we try to practice natural beekeeping, we often fail. Our practice of keeping multiple colonies in one location is by human design. The necessity of feeding bees for winter is in part-our fault. In nature, you would rarely find 4 or 5 bee colonies close together. We beekeepers often place 4, 10 or more colonies in one bee yard. This results in competition for nectar and pollen. The more beehives you have the larger chance for a food deficit. Don’t have large numbers of bee colonies in locations that don’t have the forage plants to support it. A beekeeper can help the bees on a small scale. I like to plant flowers to help the diversity of my colony’s food supply. Choose landscaping plants that bloom and produce nectar over a long time to provide natural nectar. Even so, we cant control everything and some bee colonies may struggle. In spite of good management, a large bee population in combination with dry weather conditions can leave my bees in a crisis. Do You Have a Strong Fall Nectar Flow? When I harvest my honey crop, I always leave the bees plenty of their honey. But foraging conditions in the months after my harvest, may not be good. Too little rain or too much rain can limit the amount of nectar harvested by the colony. Summer weather conditions may cause the winter stores to be consumed in July and August! Luckily, some areas have a Fall Nectar Flow. Where there is a heavy Fall nectar flow, a colony of bees may be able to make more honey to replenish their stores for winter. There may even be some excess depending on where you live. Alas, that is not the situation here in upstate South Carolina. My bees rarely make much Fall honey. If they are able to produce a little honey to finish off their winter supers – I’m happy. What Do Bees Eat in Winter? Well, you already know the answer to this question! Bees eat honey in winter. And honey can never be replaced with sugar syrup, bees need the nutrition of real honey. In milder climates, foraging winter bees may find a small amount of nectar. Most of us will have at least a couple months of cold weather and our bees need stored honey! They will not be able to fly out and work during the cold Winter days. Do not assume your bees have plenty of honey. You need to go out there and check! In my area, I will check my honey bee colonies in early September. I will feed them if needed before cold weather arrives in November. How much honey does each bee colony need for winter? That varies greatly depending on your location and your bees. Also, some bees eat more than others as well. A honey bee colony that maintains a large cluster (population) over winter and is more active will require more stored honey. Asking local beekeepers in YOUR AREA will be your best source of valuable information regarding how much honey your bees need. They are your first source for info regarding feeding bees for winter. Most of the honey bees in the US, will experience some months of cold weather. Getting bees ready for winter before the cold arrives is an important task. Leaving boxes of real honey on the hive for winter feed is the best management plan. This is sometimes a difficult task because we never know how much is enough. 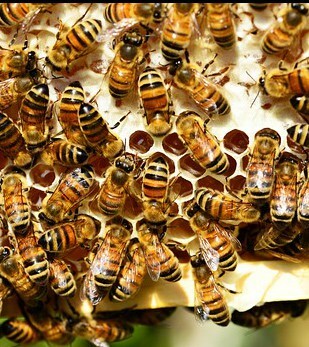 Honey bees make honey but beekeepers may need to feed their bees before winter. As we progress through the winter months, the number of bees inside the colony will drop. The older bees will start to die before new Spring bees are born. Through November, December, January and February I can expect to see fewer and fewer adult bees. This is a normal fluctuation in bee population. Populations will start to grow again as we get into February and March. Once warm weather arrives, the beekeeper needs to monitor colony conditions. Leaving too much honey (extra boxes) on the colony can cause problems. The falling population of bees may not be able to protect that honey from pests. Attacks from wax moths or hive beetles during a very warm winter can also cause colony failure. Experience has taught me to leave a deep box and a shallow box on my hives. This amount should provide my bees with enough food until early Spring. (Some beekeepers use medium boxes. ) I continue to monitor the colony throughout winter. Hive weight will tell you a lot once you gain enough experience to know what is needed. In my area, if the hive is very hard to lift from the back-the colony is probably in good shape. Beekeepers have many ingenious ways to feed their bees. Feeders can be inside the hive, hang on the front of the hive or be placed away from the colony completely. Each type of feeder has advantages and disadvantages and there is no clear favorite. On my bee colonies, I use a ventilated inner cover that allows me to place bowl shaped feeders on top of the inner cover inside the hive. I prefer this method because I have few bees to drown in the feeder. 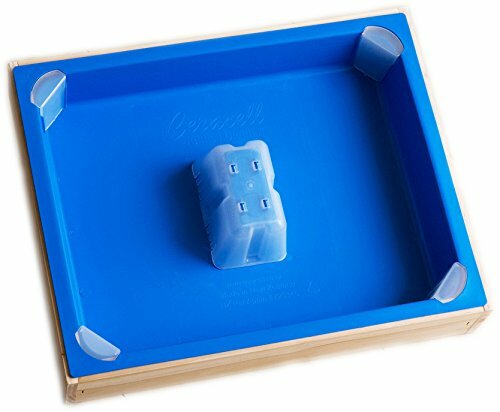 It holds a comfortable amount of feed and is easy to clean. Some beekeepers use various types of bucket feeders. 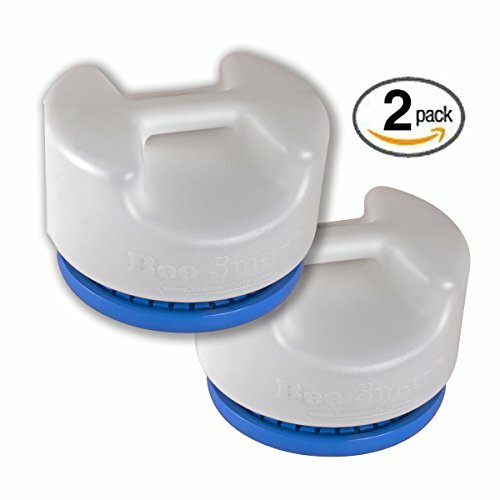 They are able to hold a lot of syrup but can be heavy to move around. 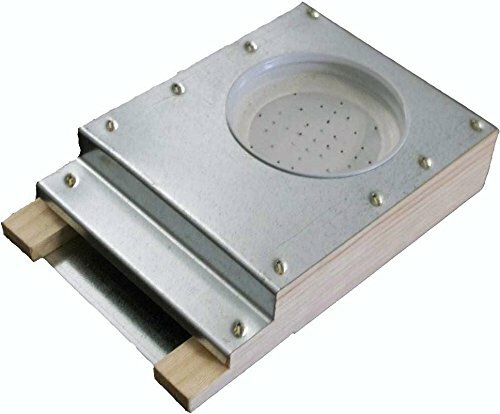 A bucket feeder is normally placed inside the hive on the inner cover. Then an extra empty deep/brood box is placed around the bucket to enable closing the hive. Outdoor feeding of bees is easy but can cause problems in the bee yard by encouraging robbing. Large commercial beekeepers often feed High Fructose Corn Syrup (yeah, I know). This is because of the prohibitive cost of feeding thousands of colonies. I don’t fault them for this practice. Any type of food that keeps the bees alive is better than letting them starve. Luckily for me, I am a small-scale beekeeper and can take a gentler approach. Pure cane sugar mixed with water (sugar water) is the food of choice for my honey bees. This mixture is as close to the composition of natural nectar as I can come. 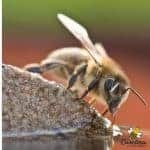 You can add a feeding supplement to promote good bee health to this sugar water. 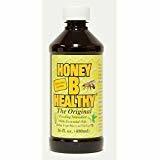 I use Honey B Healthy that is available commercially and various essential oils recipes. We must be cautious when feeding bees. During a time of low nectar availability, it will be easy to start a robbing frenzy. Take care to avoid spilling sugar water around the hives and place any outside feeders well away from your hives. You can make your own bucket feeder. Many beekeepers procrastinate late season inspections. They may find it to late to save the bees. I do not agree with the idea of taking all the honey and feeding your bees only sugar water. I believe this practice would lead to unhealthy bee colonies. Feeding honey bees for winter involves …well… feeding them well before it gets cold !! I will place my sugar syrup inside feeders within the hive but this method will not work in very cold temperatures. 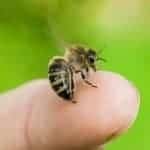 Bees are cold blooded insects and can not access the sugar syrup during cold temperatures. 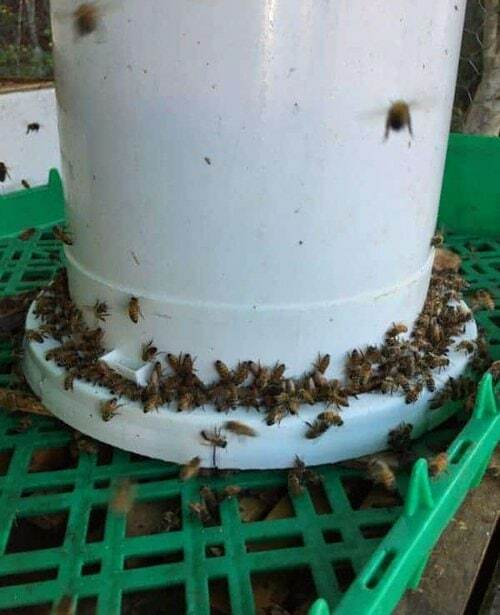 You can have a full top feeder on the colony and still have a cluster of bees die. They will not leave the cluster to obtain food. Beekeepers who fail to plan and start feeding the honey bees weeks in advance of cold weather may lose colonies. Please enjoy this raw and real video of how important it is for beekeepers to feed bees for winter stores when needed. i live in central texas we have very short winters here i have seen temps at christmas at 70% as well as 18% yeste day it was 28% in the morning and 50% at noon today it was 40% and 69 at two in the afternoon 70% next day we are haveing an early winter. i am hopeing to split my hives in march or april as the honey flow starts then jesse s.
Perhaps you will be able to if you can keep a good sized cluster over Winter.